Are we ever done tweaking our fishing rigs? Finally got around to signing up for photobucket (because we all need another place to upload photos to!) Here are some pictures of my Jackson Big Tuna YakAttack. I added several gear tracks since I didn't like the factory placement of the 1/4 -20 inserts. I use the tracks for my panfish camera mount, Rod holders using Ram Balls, VISICarbon Pro, T-Reign for gear tracks and a RailBlaza G-hold for my paddle or Park n Pole. 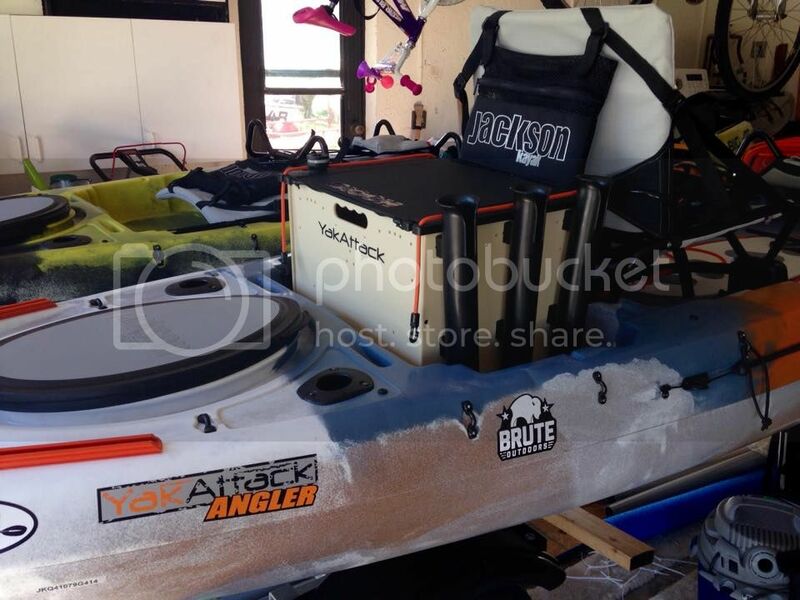 On my Brute 25qt cooler, I have 2 rod holders on one side and a gear track on the other. On the top I have a RailBlaza port that I use for one of my GoPros. The cooler still leaves plenty of room on each side in the tank well for tackle boxes, gear, etc. I made a live well out of my YakAttack Tuna Tank and left my other Big Tuna Yellow Jacket tank alone to use with the Jackson cooler. Nice ride man! But, what is that thing you are wearing over your shirt?? In addition to setting an example for my 9 yr old who was also on my kayak, we were paddling to new pass, which can have some ripping currents, I'm not taking any chances. I also have Crohn's disease which can bring me excruciating pain at a moments notice. Since I want to live to see tomorrow and hate hospitals. I wear a PFD. Plus, it gives me some places to keep tools, Chapstick, etc. Yes I sweat a little more, but my Stolquist is very comfortable. 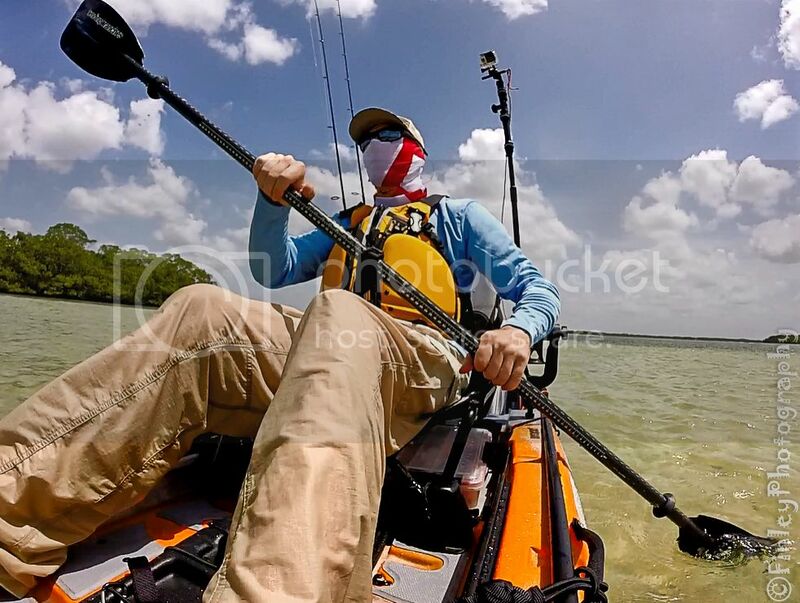 Search YouTube for Robert Field and watch the his video of a wave flipping his Hobie. Can you guys recommend a comfortable/lightweight one? Is that the High back type? You can't go wrong with Stolquist, Kokatat or NRS. 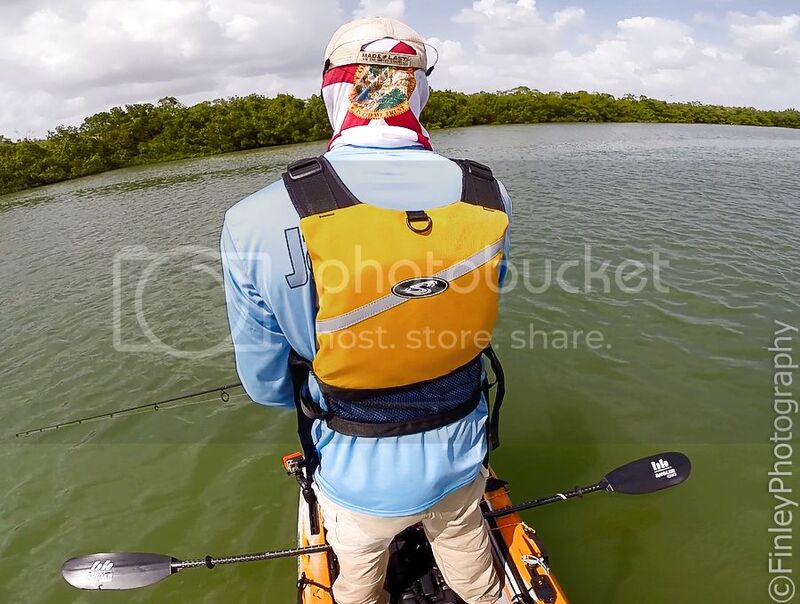 They all make a high back PFD for kayak fishing. Should you get hit by a boat or jet ski and "knocked out" wearing a pfd would be a life saver. Never know when you'll be in a catastrophe like that. Here is a pic of my custom TanPak from YakAttack. I'd asked them to make me one a while ago. They had another request for one for the fishing for soldiers tourney in Tenn (https://www.facebook.com/fishingforsoldiers) to use on an Army green Jackson Coosa.